Lauren Husting, trombone, is a low brass teaching artist working in Minneapolis-St Paul, Minnesota. She performs on tenor trombone with the jazz-infused Scottish/Irish traditional band Brass Lassie, plays bass trombone with the Adam Meckler Orchestra, and is a freelancer in all genres from classical and chamber to jazz, pop, and contemporary. Adjunct faculty at Hamline University in St Paul, Lauren also manages an active studio of learners ranging from beginner to advanced, middle school to adult, and works to provide private lesson opportunities for low-income students in her region. She is committed to building community among women in the local and regional music scene, and encouraging all her students to develop healthy and creative ways to make music in their lives. 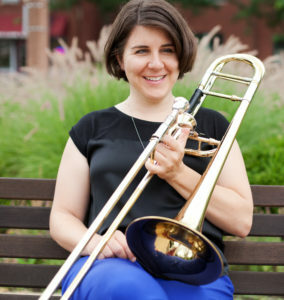 Lauren received her Masters in Trombone Performance from the University of North Texas in 2007, and her Bachelors in Trombone Performance from the University of Wisconsin in 2003. She can be found online at laurenhusting.com and is on Twitter, Facebook, and Instagram. Thanks Lauren for sharing this post with us! I’ve talked to very few women musicians in my life who claim to have never experienced bias or sexism while at work or in training. Most of us, at some point, will be on the receiving end of chauvinistic behaviors ranging the gamut from subtle to severe. In many cases it may just be a person unaccustomed to speaking to professional women, or an older colleague with a slightly outdated mindset who doesn’t really mean any harm. But even the smallest offenses can be exhausting and discouraging for us. There are ways to fight back, if you can recognize the symptoms. Here are five categories of bias that I’ve encountered in my career, and ways in which I’ve managed the situation. In no way is this an exhaustive list; let’s keep the conversation going! The classic. Someone just can’t seem to get over the fact that you play well, and they want to know exactly how you got your skill. It might be just an offhand comment or an awkward way to start a conversation with you, but sometimes it can manifest as utter disbelief in your ability. When that happens, it can feel pretty insidious and disconcerting. Sometimes it feels like they don’t think you actually understand how you got there yourself, or that it’s all luck or talent. I’ve usually answered with responses that are a variation on “here are my credentials” (and sometimes with a snarky “Well, I’ve got lungs and arms and a pair of ears, so…”). The best way to fight it is with action: continue to play your best, speak your opinion, and act professionally. Man, I hate this one. You’ve just suggested that your group try a crescendo under a phrase, and Bill interrupts you with some other thought. Then Joe jumps in and suggests a crescendo. Everyone says, “Great idea, Joe!” and you’re left to wonder if it even matters if you say anything. It’s pretty rude, and it’s definitely learned behavior. More and more research is showing that, generally, men interrupt women more than vice versa, and control any given conversation a majority of the time. I’ve become very sensitive to this, and have learned to push back- “please let me finish my thought” or “that’s a great idea you and I both had.” If it’s a group I want to continue to play in, I might consider having a conversation with the other members about respecting everyone’s right to talk equally. In feminist terms, emotional labor is defined as the work female-identifying folks do to manage the feelings of those around them, and maintain social relationships. For us as musicians, it could mean any number of things: maybe always being the one to bring snacks to rehearsal, the one to think to send out thank you cards to donors, or feeling like you have to smile all the time or not be allowed to be in a bad mood (when the guys get to be cranky whenever they feel that way). For an in depth look at how others define emotional labor in their lives, I highly recommend the annotated Metafilter thread on EL that can be found in this google doc. Because it’s a near invisible bias, it’s a tricky one to navigate. I find the easiest way to make sure the emotional labor in my groups is balanced is to just be very clear about what I’m comfortable doing, and say no to things I don’t want to do or suggest that someone else take them on. Of course, managing these things is yet MORE emotional labor and the best solution I’ve come up with yet is to make sure I surround myself with colleagues who are capable of being emotionally competent adults without my help. Gaslighting is a pretty nasty little bit of control, used commonly against female-bodied folks and POC. It’s defined in dire terms: “the act of manipulating someone psychologically into questioning their own sanity.” Abusers use it (I was the target of gaslighting by a former teacher), dictators and narcissists live by it, but anyone can do it. It can be as simple as dismissal (“you didn’t really think that I meant that, did you?” or “but he’s so nice to me, I don’t know why you have a problem with him!”) or a complex as full-on manipulation (with this instructor, I didn’t know up from down with all the lies and aspersions that were being cast on me, in addition to the confusion of occasionally being praised or coddled). If you think the person you’re dealing with is good at heart, it’s worth talking to them carefully about their behavior. If not, it’s best to distance yourself from them, and keep other people in the loop about why. In my situation, I wrote down everything that happened in every lesson, and was able to use that when I escalated the situation to administration. Perhaps it belongs in the gaslighting section, but in my blog entry titled “I’m Just a Girl Standing in Front of a Jazz Band,” I mentioned getting to college and having a man student tell me I’d gotten into the top jazz group because the teacher probably wanted to sleep with me. I didn’t realize for YEARS how much that affected me, or realize how ridiculous it was considering my credentials.